Jeans?? I thought he said he was wearing his Sunday best!! Well....hopefully they are at least TIGHT jeans!! OMG--TIGHT JEANS--LONG LEAN LEGS. IF HE BENDS DOWN I AM A GONNER. WHERE IS LORRAINE? SHE IS ALWAYS AT THE CELLCERTS. SOUNDS LIKE A YOUNG GIRL THIS TIME SINGING HARK THE HERALD. She sounds so cute!!! Lots of clapping for the child. She ends and music and NOW THE MAN!!! I never found out the name of opening song last night, but it sounds like the same song. Lots of screaming and now that heavenly voice from heaven is touching them all. I hate I don't know this song yet...but he sounds wonderful. Connection isn't that great but I heard a couple of strong notes and some acknowledgement from the crowd. No outfit report. PAL can't talk. Song ends to thunderous applause!!! Somebody speaking and doing an intro like thing. sounds like a woman. 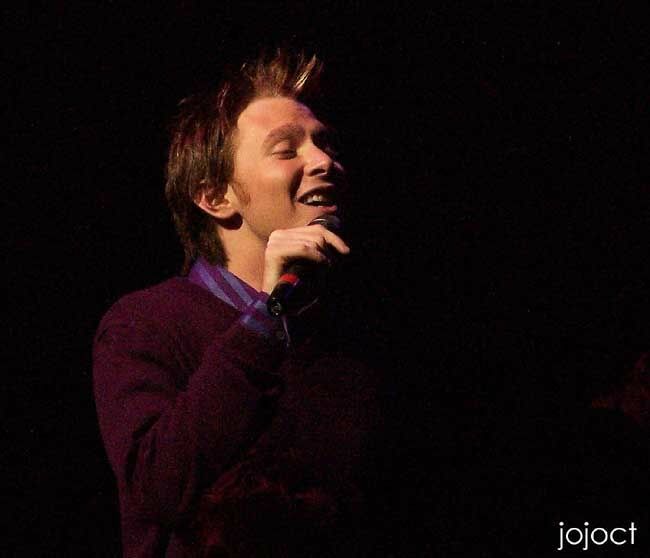 Ladies and Gentleman, once again CLAY AIKEN!!! JUST HEAR THOSE SLEIGH BELLS RING. SO, DOES ANYBODY WANT "CLAYSMO"? TRANSLATION.. A RASBERRY COSMO WITH A SPLASH OF CHAMPAIGNE.. THAT'S THE NEW DRINK I MADE UP FOR US..
We will have to "raze" on Linda and Lorraine for being party poopers!!! THANKS TAMMY FOR THE UPDATE. I HOPE I CAN MAKE THE WHOLE NIGHT, I HAD A PRETTY BUSY DAY TODAY. hello all!!! i just woke up from sleep!! where is Lorraine as all caps was saying?? The pictures are great... Hey everyone! OK that's it. I'm wearing checkered stripes to the concert. Wonder where you get such a thing...? Major screaming at him starting to sing...then when he comes out on stage. Lots of catcalls and screams still going... ick. I hear lots of screamers tonight. He sounds really strong. The drummer seems to have some issues. SR is still really fast. lol. Audience starts clapping along. Female voice introducing the choir, etc. The audience sounds more hyper tonight. I think his voice sounds better tonight...I can hear his vibrato again. SR..much more peppy, audience was clapping along at first. His voice is stronger on this song too. Powered by SMF 2.0 RC3 | SMF © 2006–2010, Simple Machines LLC Page created in 0.063 seconds with 24 queries.